This is a special foot that is ideal to stitch curves or sew over cross seams. Thanks to its short size and rigid rear part, the foot masters its tasks with flying colours. The foot can also be used to sew necklines, cuffs, sleeves and children's wear. Thanks to its adjustable edge this guide allows you to position edges and hems precisely and thus adjust the correct seam distance. Would you like to have a selection of feet and a storage box to keep them in? If so, the baby lock feet set is the right choice for you! This feet set gives a multitude of choices for both decorative and functional stitching. Includes: blind hem foot – bead foot – piping foot 5 mm – elastic foot – shirring foot – lace foot. The shirring foot is used to join two layers of fabric and gather the lower layer at a ratio of 2:1 in one go. Adjusting the Differential Feed and Stitch Length will alter the rate of gathering to suit your project. 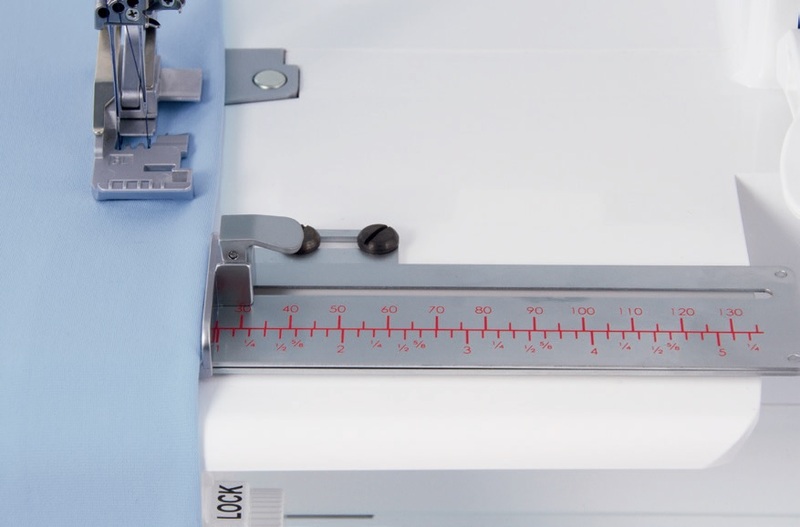 The single fold bias binder permits a professional binding of open fabric edges (for example necklines) with the cover or the two-thread chain stitch. The bias or jersey strip is guided in such a way through the binding attachment that the top side is double fold in. The bottom side lies even and with open inside at the fabric edge. Addition of the rake allows a little tension to be applied to the strip. The stitch pattern book contains basic stitches, combined stitches, coverstitches as well as stitches for which you need special accessories. Furthermore, it also shows various decorative stitches and wave stitches. Our stitch pattern book is a handy guide to help you get used to every feature of your new baby lock machine. The book provides plenty of information about stitches and how or where to use them, about the finished pattern and all corresponding machine settings. The book also suggests numerous ideas that will inspire you to explore the possibilities of your baby lock. It is an indispensable book for every baby lock owner. All stitch patterns are hand-made so that you can touch them and see them. The transparent curve foot is ideal for curved seams and provides a better view of your sewing project. It also makes it easy to sew over cross seams. Narrow sleeve cuffs and necklines will no longer pose any problems when it comes to finishing the edges. Thanks to the guide slot, even ribbons can betaken up and integrated into the seam.